We arrived in Melbourne on the 20th November and are staying with my good friends from school Kathryn and Laura while we are here. They have a flat on Victoria Parade which is a perfect location as it is in walking distance to the city centre and had a spare bed for us which is both comfy and saving us a lot of money (it would be over $1000 each for the 5 weeks if we were in a hostel). Another school friend Amy was also staying with them when we arrived as well and so there was a house full of Geordies for a few weeks which made it feel even more homely. The day we arrived, after dropping off the car and getting settled, we went into the city centre for a late lunch (burgers) and a drink at a cool roof top bar that Kathryn and Laura go to – it was nice to do normal city living after budgeting so much since we started our travels. We also tried our first (definitely not our last) Slurpie which is like a tango ice blast/slush in loads of different flavours and only $1! We have them all the time – especially if its hot. While Kathryn, Laura and Amy went to work, me and Niall spent our days exploring the city. Melbourne is great and its so easy to see why travellers end up spending a long time here to work and live like an Australian! Living with Laura and Kathryn has also meant we were given lots of tips about living in Melbourne and the best ways to get around. Amy and Laura’s really good friend (who is also a friend of ours from school) Caroline also came to stay with us for a bit. This was especially nice for everyone as she has been living in Australia for 2 years and it was the first time everyone had seen her since she left. It’s been great hearing about everything she has done and having all of the Aus colloquialisms she has picked up explained. A few days after she arrived (and around 4 days after we got to Melbourne) we all went to the Queen Victoria Night Market. This place was amazing and on every Wednesday night in summer and winter with different stalls depending on the season. The market had every different type of food you could think of! 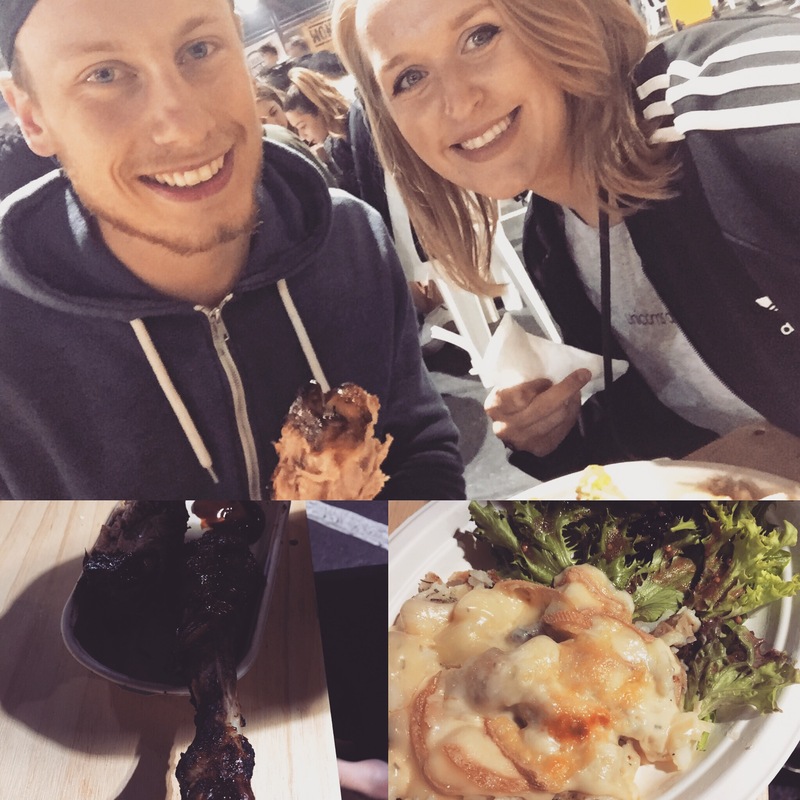 We all split off to find our chosen food for tea – Niall got two giant BBQ turkey legs and I got French fondue cheese over potatoes with salad (so much cheese – it was fantastic!). Me and Kathryn then shared some Churros and had fresh lemonade. It’ll definitely be a regular Wednesday night activity so that we can try as many different types of food as possible! Our first Friday in Melbourne, 5 days after we arrived, Kathryn and Laura made the most of having all of their friends here (Kathryn also had some friends from when she was living in Thailand who were in Melbourne too) so we had a small gathering at theirs. It was really nice to get made up, have some drinks and meet new people as we haven’t really done that much since we started travelling as we moved around so much. Australia is very expensive and especially alcohol in bars and clubs. Pre-drinking is a must and even buying bottles of alcohol can cost a lot – another reason we waited until Melbourne before drinking loads! We wanted to try work a bit whilst we were in Melbourne seeing as we were here for 5 weeks. The issue we had was that a lot of jobs don’t want people for such a short amount of time so temp/ casual work was our best option. I was given a day’s work working with Kathryn and Laura at a factory for the company YayMe. This involved packing up stock, printing names onto products, dusting glitter off baubles and fault checking the products. It was only a day’s work but was good to get an insight into the behind the scenes of ordering things online! I’ll be doing lots of posts about our time in Melbourne so that I can fully explain what we have seen and what Melbourne has to offer – this is just a taste of how our first couple of weeks in Melbourne have gone. It’s been great!